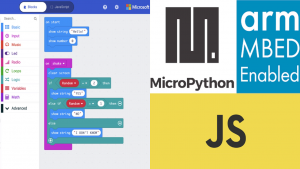 Makerdemy > Blog > Development board > BBC Micro:bit : What programming language to use? The easiest way to program the BBC micro:bit is through the online Visual Programming based block editor. The drag and drop feature is a great way to introduce programming and logic building to beginners. Text based programming languages are best suited for those who want to learn more about programming. For people familiar with python, Micropython based IDE (Integrated Development Environment) called Mu Editor is the best choice. You can take advantage of File Systems to read and write files into the memory. Moreover, proper debugging option is only available in Micropython for BBC Micro:bit. This is done using REPL (Read Evaluate Print Loop) feature of Micropython. The drawback of using Micropython for BBC Micro:bit is that we can’t use BLE (Bluetooth Low Energy) due to low RAM size. It happens because Micropython itself uses a lot of RAM to begin with. MBed Platform based on C Programming can be used by professionals to implement advanced projects. C Programming has the advantage of running fast. It is more reliable if properly coded in micro:bit for advanced projects. The disadvantage of using Mbed Platform is that it is poorly supported and the online editor is not user friendly. None of the 4 languages are the complete implementation of the real programming languages. You have to compile or download the code that you have constructed and then copy it to the micro:bit to run it. This is slow and far from interactive. None of the four editors provides adequate debugging facilities. The good news is that due to increasing popularity of BBC Micro:bit the creators having started putting in more resources and solving bugs. They are constantly updating each programming language to include more resources. Ultimately the choice of language depends on the skill level and the intended application.